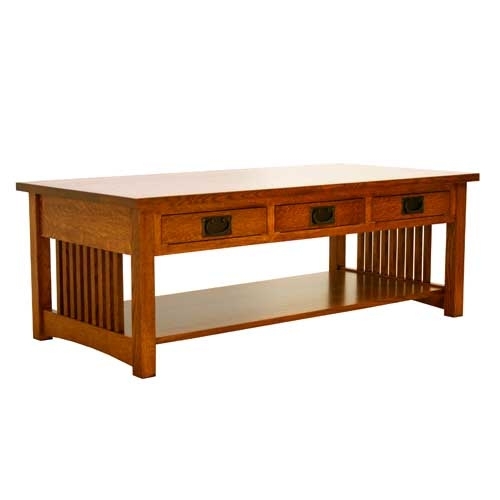 Our American Mission Three Drawer Coffee Table features classic Spindle sides and a simple bottom shelf reflecting it's true Mission design heritage. 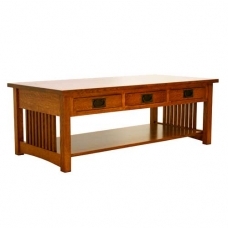 This Bench Crafted piece has three Solid Quartersawn Oak Drawers, Spindled sides and a bottom Shelf ideal for keeping your current book, Kindle or IPad and is Made in the USA. Also available in a smaller 25" deep size. Our Clearly Amish series of furniture has a complete selection of Living Room Furniture in four different styles. Every piece is "Bench Built" and hand crafted for exacting quality. We use hand selected, old growth, 5/4 Quartersawn Oak and Cherry wood from renewable sources. Each piece uses Mortise and Tenon construction, Solid Dovetail Oak Drawers, hand applied finishes with a conversion varnish, the most durable finish available. A perfect addition to your home.